The Association for Strengthening Agricultural Research in East and Central Africa (ASARECA) launched the regional cassava research and development program in the sub-region through a joint work-planning session held in Kampala last week. The planning session was attended by the Catholic Relief Services (CRS) and the International Institute for Tropical Agriculture (IITA), joint implementers of the $22.3 million Great Lakes Cassava Initiative funded by the Bill and Melinda Gates Foundation. National scientists from cassava research programs in Kenya, Uganda and Tanzania attended as key implementing partners. The new initiative builds directly on USAID/East Africa’s Crop Crisis Control Project (C3P), funded with support from the Famine Prevention Fund. The three major partners in this cassava "mega-project" (CRS, IITA and ASARECA) will implement activities in collaboration with scientists from national agricultural research institutions and universities in the region. The objective is to work with farmer groups and reach about one million farm households in the sub-region over the next four years. USAID/East Africa supports this effort through its grant to ASARECA. Over the past few decades, the potential production of the cassava crop has been greatly reduced by the cassava mosaic virus disease as well as the emerging cassava brown streak virus disease. The viruses move quickly through cassava fields, rendering up to 100% of the crop inedible. The main thrust of the ASARECA project is to contain the spread of these two key diseases through research and development initiatives that will develop disease resistant cassava varieties and make them available to farmers. Activities will focus on the selection of resistant varieties, their multiplication and distribution, and on developing a favorable policy framework that will support and facilitate efforts to commercialize cassava in the region. 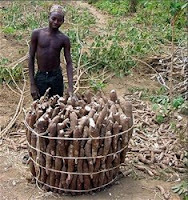 With an estimated total production of 30 million tons, supporting about 200 million people from the sub-region in some way, cassava is the second most important staple crop in the region after maize. Controlling the spread of the two cassava diseases will help to improve food security and protect livelihoods within the region.